Late Company by Jordan Tannahill won the 2013 Best Production and Audience Choice Award at SummerWorks and the 2013 Herman Voaden playRites Award. In the play two sets of parents – those of a bullied boy, and those of a the chief bully – sit down to dinner to attempt to a reconciliation. As one might imagine it all goes terribly wrong with the adults bullying each other. If this plot sounds familiar, it is not just because bullied children are so much in the news. 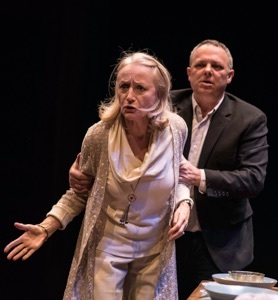 It is because in outline the play, the most conventional written by Tannahill, is nearly identical to the worldwide hit by Yasmina Reza, Le Dieu de carnage (God of Carnage) from 2006 that has been presented in Toronto both in French in 2011 and in English in 2013. Roman Polanski made a film of the play in 2011. There are key differences between the two plays. Reza’s is a comedy whereas Tannahill’s is deadly serious. Reza’s is about two boys in elementary school, whereas is Tannahill’s is about two teenagers in high school. In Reza’s play the bullied boy is only injured, but in Tannahill’s he commits suicide. In Reza’s play only the four parents meet, while in Tannahill’s the parents of the presumed bully bring their son with them to the dinner although, except for a letter he reads, his dialogue is minimal. The problem is that there are far too many similarities. In both cases the idea for the reconciliation is that of the mothers – an art lover in Reza, an artist in Tannahill. In both cases the bullied boy has liberal parents as opposed to the more conservative parents of the bully. In both cases the superficial attempts at find common ground give way to underlying resentments. In both not only do the fathers argue with each other and the mothers with each other, but both husbands argue with their wives. This is a structure inherent in this kind of parental reconciliation play, and Reza got there first. Not only that, even though Reza has shaped her play as a comedy, she makes the same serious points that Tannahill does in the guise of drama. Bullying among children and teens is hardly going to vanish unless parents recognize the types of bullying they themselves engage in. Reza takes this a step further than Tannahill by making clear that the parents of the bully are wealthier and think themselves as member of a different social class than the parents of the bullied boy. This connects bullying with power structures in a hierarchical society. Tannahill ignores this aspect of the problem and turns the drama in on itself to be more about the parents of the bullied boy than about the larger problems of bullying in general. It is not that Tannahill consciously or unconsciously used Reza’s play as a model, but rather that anyone who knows Reza’s play will feel that he is covering familiar territory. In both plays the author introduces us to the parents of the bullied boy first while they await the arrival of the other set of parents. In Tannahill, the parents are Debora (Rosemary Dunsmore), a sculptor, and Michael Shaun-Hastings (Richard Greenblatt), a “red” Tory and MP. It is one year after their only son Joel took his life by slitting his wrists in the bathtub. The pop-psych notion why Debora and the bully’s mother have arranged this meeting that they think they can achieve “closure”, oblivious to the possibility that a meeting may simply reignite tensions rather than put them to rest. Deb and Michael’s guests who arrive late, as per the title of the play, are Tamara (Fiona Highet) and Bill Dermot (John Clelland) and their son Curtis (Liam Sullivan). Only Tamara seems actually to want to be there. The plan for the dinner is that Debora will read an victim impact statement and that Curtis will read an apology. Debora cannot finish her statement because it brings back her emotions. After Curtis’s statement, she not only accuses him of being disingenuous in his apology, but suddenly goes out of control and accuses Curtis and his friends of taunting her son until he committed suicide and his parents of insincerity. The assumption all have at the dinner is that Joel was bullied for being gay, even though Joel never came out to his parents. Curtis says that Joel deliberately tried to call attention to himself through various ploys including wearing eye makeup to school, a fact Deb and Michael didn’t know. Indeed, the more the families argue, the more we realize that there is quite a bit that Deb and Michael didn’t know about their son or about how Curtis and his friends were hounded by the press. Michael, in fact, has kept information secret from Deb, thinking she wouldn’t be able to handle it. Ultimately, unlike Reza’s play that focusses equally on all four parents, Tannahill’s focusses primarily on Deb and her mistaken impression that she knew Joel better than anyone else. She may have tricked herself into believing she wants “closure”, but events demonstrate quickly that what she really wants is revenge on Curtis for “murdering” her son and on his parents for their claiming ignorance as to what Joel was doing. This plan blows up in her face as she becomes aware how little she really knew of Joel’s life. Paradoxically, Tannahill’s play about the extreme result of bullying is less about bullying than it is about teenagers’ isolation from their parents. to spill out every bottled-up thought without quite knowing that she is doing so. It is a frightening truthful performance. Tannahill does not lavish the same detail on the other characters. Greenblatt’s Michael the politician is very careful not to lose his composure and clearly forces himself back to neutrality whenever he does react in anger. Clelland plays Bill initially as a man already aware of the blame that his hosts may try to foist on his family and almost too ready to pounce on every perceived slight. Highet’s Tamara comes off as the most rational of the parents. She initially plays Tamara as naive but she is the one with the most balanced view of what has happened since the Shaun-Hastingses are completely ignorant of Curtis’s persecution in the press and of videos that Joel posted on YouTube. Sullivan plays Curtis realistically as a teenager dragged into the midst of a bizarre adult ritual. Except for his unemotional statement, he says little unless he catches an adult in a clear misstatement of fact. Most of the time Sullivan makes Curtis look as if he wishes he could disappear and be anywhere else. Gradually though, even in his silence he begins to look on the fighting adults with a sense of shame and embarrassment. Peter Pasyk has impeccably directed the action, perfectly ratcheting up the tension and gauging the pauses. He makes the design of the play quite clear in how Tannahill gradually undermines our sympathies that at first naturally support Deb and Michael as parents of a dead bullied teen as more information from the Dermot family comes forth. In fact, it is quite a feat for Tannahill to have us questioning the parents whom we first identified with in the space of only 75 minutes. At the same time we may feel, even at the end, that Tannahill has not given us enough information about Joel or Curtis for us make any clear judgement about cause and effect in Joel’s death. Tannahill is satisfied merely to reveal a situation that seemed clear-cut as more complex. Late Company is a play to see for its quintet of excellent performances, especially for Dunsmore’s outstanding turn, and for Pasyk’s expert direction. Because Tannahill makes the situation more complex, you are less likely to feel as much concern for the widespread fact of bullying as you would from God of Carnage or from a play directed at teens on the subject like Dave Deveau’s tagged, also from 2013. If Tannahill wanted to prove that he could write a conventional dining room play, he has. Let’s hope that in future he continues to mine the more experimental vein that he has explored in works like Concord Floral. Photos: (from top) Rosemary Dunsmore, Richard Greenblatt, John Clelland, Fiona Highet and Liam Sullivan; Rosemary Dunsmore and Richard Greenblatt. ©2015 Dahlia Katz.